That's me out front there. 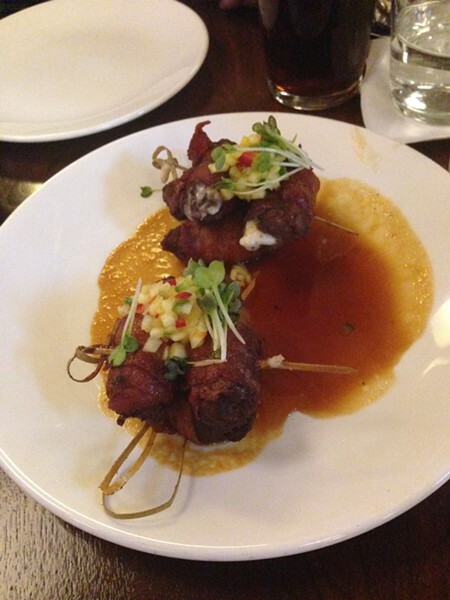 Even our server wouldn't call it by name. I'm a sucker for a well-executed theme, and in most of these cheesy themed restaurants it doesn't matter if the food is little more than edible so long as everyone's having a good time. If a regular old restaurant—one called, say, Present Times—served the same food as Medieval Times, they'd be Yelped out of town. Dinner doesn't necessarily taste better with a bunch of long-haired men on horseback distracting you, but they make it a lot easier to not care what you're cramming into your maw. But I was misled by the fact that Level 257's website says that food is the centerpiece of the entire experience. And as ridiculous as a "Filet Mig-nom" sounds, it's one of the only dishes on a menu of starters, sushi rolls, pizzas, sandwiches, pastas, and main courses that nods toward the Pac-Man theme (OK, the main dishes are called "main bytes" and the cocktail menu features a "Pinky"). Elsewhere at 257, the theme is inescapable, but not in a bad way. Glass cases are loaded with obscure Pac-Man paraphernalia, and the arcade features a few games I'd never seen before, including Level 255, a version of Pac-Man that allows players to begin their game one level before the infamous kill screen. And as many as four players can participate in a group game of Pac-Man (from game-show-style podiums) that's projected on an enormous video screen situated between an auxiliary cocktail bar and one of two sets of bowling lanes. That's all on the second floor. Upon entering on the first floor, the first thing visitors see is a souvenir shop filled with anything you could slap a Pac-Man logo on (including what appeared to be counterfeit Isaac Mizrahi makeup bags). Even amusement parks let you enjoy the ride before sending you through the souvenir shop. On a Saturday night at 7:30 PM, the restaurant is packed and loud as hell—lots of large parties, lots of birthdays; no surprise there. A friendly server pitched us their craft cocktails, most of which feature a juice, all of which he told us are squeezed fresh every day. A lot of the drinks are on the sweet side, but a Split Screen with apple vodka (I know, I know), grapefruit juice, St-Germain, and bitters is refreshing and not too terribly saccharine. It's usually a bad sign when prices don't appear on a drink list, and sure enough the cocktails are $12 each, which is a premium, be it in the city or the 'burbs. Things kind of went haywire from there. An order of meatballs, each one topped with a spicy marinara and a gob of fresh mozzarella, is pretty unremarkable, but disappeared a lot faster than the other appetizer we ordered, the server-recommended tiki rumaki. It's hard to imagine that cheese wrapped with beef wrapped with bacon could be bad, but these were pretty lame, thanks in no small part to flavorless, spongy beef and a slick loogie of cheese that basically evanesced on contact with the tongue. I'd be very surprised if these little bundles were made fresh on a nightly basis. The Donkey Kong potato was sort of a culinary bust (surprise! 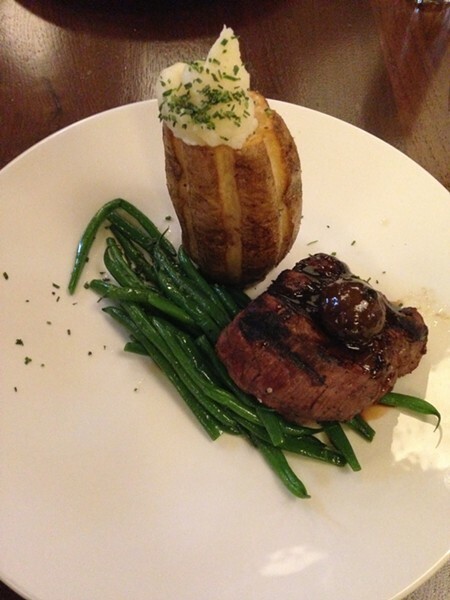 ), but the steak served alongside it was tender, well seasoned, and properly cooked, as it should be for $34. 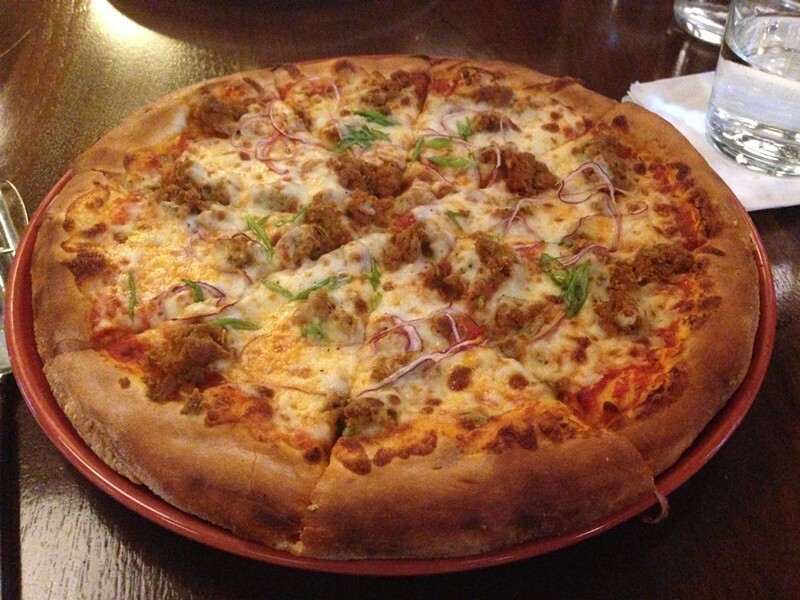 Large enough to share among two or three people, the $15 Italian sausage pizza is a substantially better value. Unfortunately, it's bad. The menu brags that it's topped with handmade fennel-seed sausage and fresh ricotta, but I didn't detect any of the latter, and the sausage, handmade or not, was reduced to a dry, pulverized meat-like substance by the heat of the oven. The crust is puffy and flavorless—we couldn't decide if it reminded us more of a Pizza Hut hand-tossed pie or something that would be served in a high school cafeteria. If they really wanted to be cute they'd remove a slice and call it a Pac-Man pie. We skipped dessert in favor of a couple of all-you-can-play passes (cards, rather) to the arcade, $10 for 30 minutes. That arrangement sounds like an OK deal, except that there's no guarantee that the games you want to play will be unoccupied during the 30-minute window you have to play once you've tapped your card for the first time. I wasted at least a few dollars standing idly by and tapping my foot impatiently as a couple of seven-year-olds monopolized a really fun-looking 4-D zombie-shooting game. We settled for shooting dinosaurs in Jurassic Park as dinner churned in our bellies. Even Pac-Man would've left with heartburn. 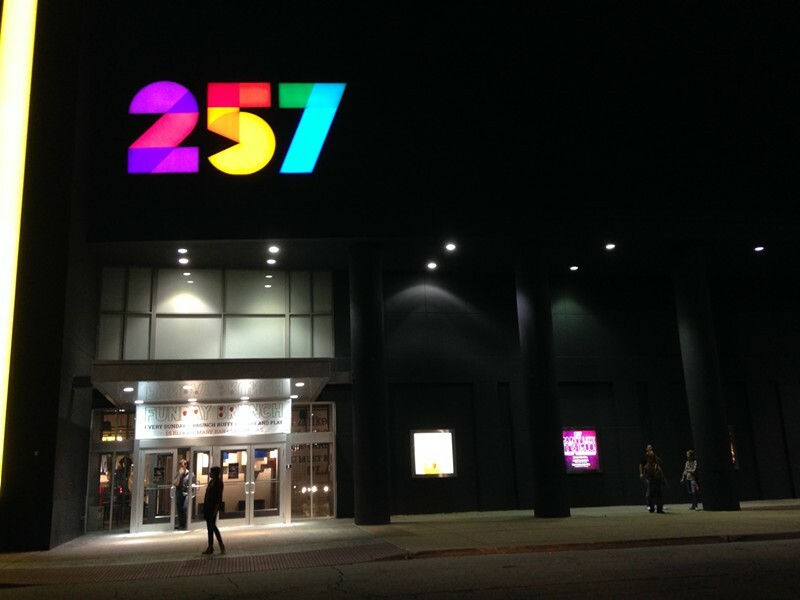 Level 257, Woodfield Mall, Schaumburg, 847-805-0257, level257.com.